STL produces cold-bonded electrical contact rivets which allow for shank entry points as well as indent points to aid auto-assembly. 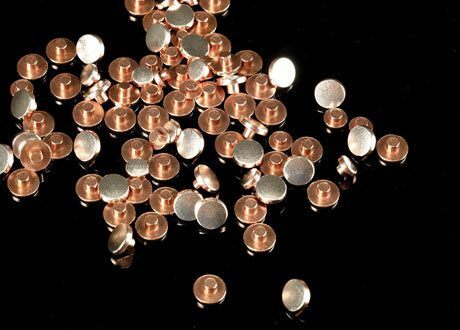 We also produce larger diameter rivets, suitable for switching over 200 amperes. These compare favourably on cost with brazed parts, which can be slow to produce. Our use of high quality materials such as silver tin oxide enables rivets to withstand rigorous short-circuit testing in difficult conditions. We also manufacture riveted components using automated in-die riveting processes. Parts are assembled, checked and stamped in a single process at speeds of up to 300 parts per minute.